Explanation: Denizens of planet Earth typically watch meteor showers by looking up. 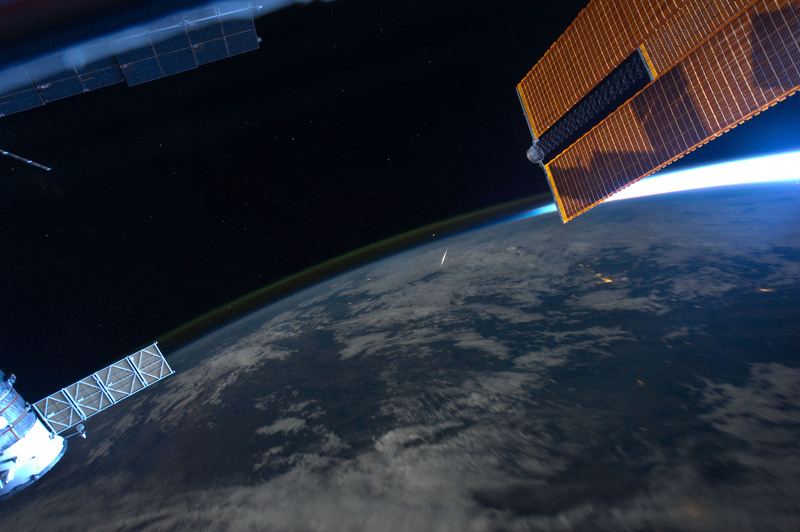 But this remarkable view, captured on August 13, 2011 by astronaut Ron Garan, caught a Perseid meteor by looking down. From Garan's perspective onboard the International Space Station orbiting at an altitude of about 380 kilometres, the Perseid meteors streak below, swept up dust left from comet Swift-Tuttle heated to incandescence. The glowing comet dust grains are traveling at about 60 kilometres per second through the denser atmosphere around 100 kilometres above Earth's surface. In this case, the foreshortened meteor flash is right of frame centre, below the curving limb of the Earth and a layer of greenish airglow, just below bright star Arcturus. Want to look up at a meteor shower? You're in luck, as the 2014 Perseids meteor shower peaks this week. Unfortunately, the fainter meteors in this year's shower will be hard to see in a relatively bright sky lit by the glow of a nearly full Moon.